The purpose of the biomechanics lab is to provide facilities which will enable surgeons, scientists, and engineers to conduct experiments regarding activities of daily living. Using our state-of-the-art equipment, we are able to quantify the extent of human movement and to gain a better understanding of the way the human body works. Our in-house designed knee joint simulation machine is capable of subjecting human cadaver knee joints to movements common to everyday living. These activities include squatting maneuvers, stair ascent and descent activities, walking, and simulated sports movements. Computer-controlled actuators allow the machine to simulate muscle forces and external reaction forces, while sensors on the machine are capable of recording the forces of the knee joint which are associated with these activities. Our custom-designed foot and ankle simulation machine allows researchers to simulate the conditions of normal walking to study the effects on the bones, ligaments, and tendons that comprise the ankle joint. Using patient-derived gait data, our machine simulates the gait pattern from heel strike to toe off. Pneumatic actuators simulate muscle forces, while a force platform embedded on the machine records ground reaction forces. Examples of pathologies which can be studied with this machine include Lisfranc/Chopart injury, adult acquired flatfoot deformity, and total ankle replacement. In the simulator, specimens perform clinically PROBLEMATIC ACTIVITIES or undergo CLINICAL EXAMS with simultaneous measurement of joint kinetics and kinematics. Check out our Youtube video. 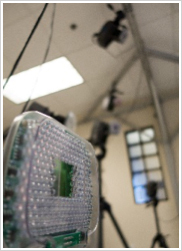 Our 12-camera Motion Analysis motion capture system enables researchers to capture the three-dimensional movements of bones in the body. This can be accomplished with active patients participating in functional activities or applied to cadaveric applications in conjunction with our joint simulators. IORE provides quantitative information about movement patterns, joint forces, and muscle activity. These analyses help orthopedic specialists improve surgical techniques, validate implant designs, and analyze sports performance.